Christianity, Catholic bishops, with one exception, didn’t allow the mistletoe to be used in churches because it was one of the major symbols of Paganism. Before the Reformation, a priest at the Cathedral of York brought a bundle of mistletoe into the sanctuary each year during Christmastide and put it on the altar as symbolic of Jesus being the Divine Healer of nations. The English used mistletoe as a Christmas decoration for their homes. In Medieval times, branches of mistletoe were hung from ceilings and put over houses and barn doors to repel evil spirits. People believed the plant could extinguish flames. Although much of the Pagan symbolism was forgotten, the plant represented good will, happiness, good fortune and friendship. The plant has qualities including the power of healing, rendering poisons harmless, good luck, great blessings, bestowing fertility on humans and animals, protection from witchcraft and banishing evil spirits. Enemies who met Druids under the forest mistletoe laid down their weapons, exchanged friendly greetings and kept a truce until the next day. The Celts suspended mistletoe over doorways or in rooms as a symbol of good will and peace to all who visited. The plant is a fertility symbol and the soul of the oak tree. Belief was that the mistletoe could come to the oak tree during a lightning flash. Mistletoe was gathered at mid-summer and winter solstices. The plant, when it grew on the venerated oak tree, was especially sacred to the Celts. 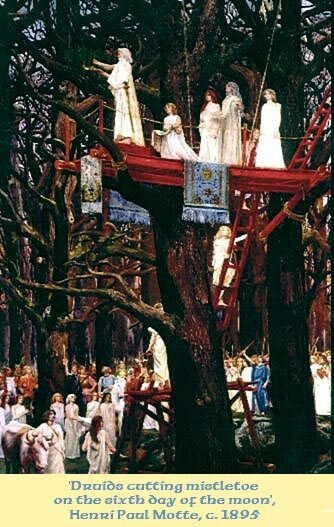 On the sixth night of the full moon after Yule, white-robed Druid priests gathered oak mistletoe by cutting the plant with golden sickles. Two white bulls were sacrificed with prayers that the recipients of mistletoe would prosper. 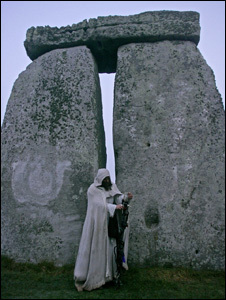 In the scene quoted above, the Druids are preparing for a ritual sacrifice which involves a white-robed priest carrying a golden scythe while climbing an oak tree to ritually cut the mistletoe. According to Pliny, it was the Valonia oak the Druid’s believed was the most sacred tree to gather mistletoe from and that it would heal poison and encourage fertility. Celtic art is resplendent with what are believed to be mistletoe motifs. Some artifacts have been found that resemble human male heads adorned with a crown of comma-shaped leaves that resemble mistletoe. Historians believe these finds may be representations of crowned Druid priests.